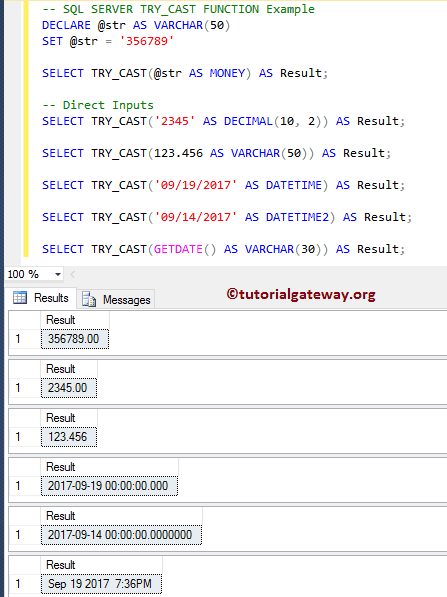 The SQL TRY CAST function is one of the SQL Conversions Function which is similar to CAST Function. It is used to convert an expression from one data type to another. If it succeeds then it will return the expression in the desired data type otherwise, it will return null. 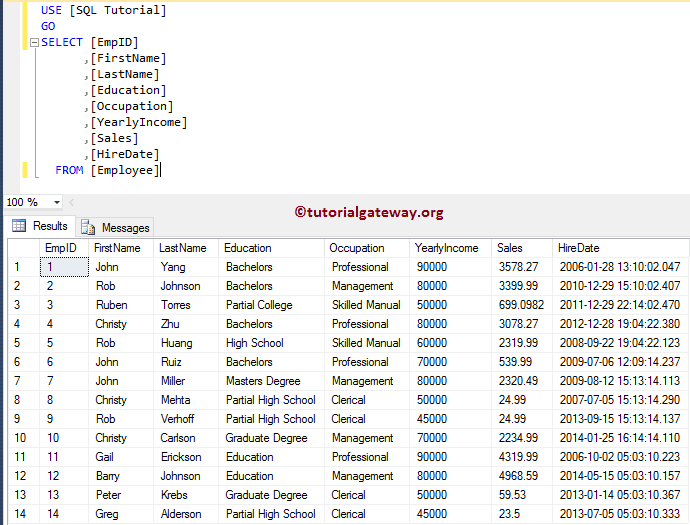 In this article, we will show you, How to use, or write SQL Server TRY CAST with an example. For this, we are going to use the Employee table from SQL Tutorial database. Expression: Specify any valid expression that you wish to convert. Length: It is an optional parameter of integer type. You can use this parameter to specify the length of the target data type. TIP: If the SQL TRY_CAST function is unable to convert an expression into the desired data type then this function will return NULL. If there is no possibility to explicitly convert to the desired data type then it will throw an error. 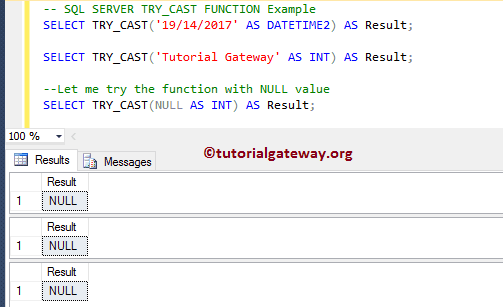 The SQL Server TRY_CAST Function help you to convert any expression to the desired data type. 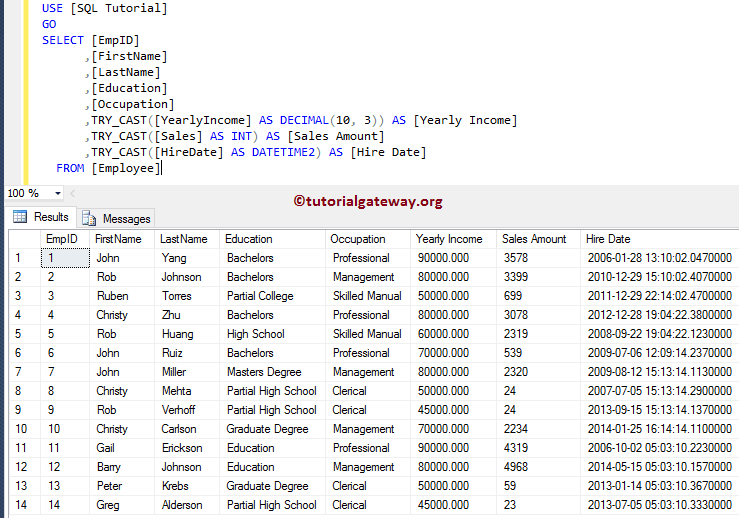 The below-shown query will show multiple ways to use this function. As you can see, it is returning the same result as we got in the Cast function. We have already explained the program flow in SQL CAST article so, please refer the same. In this example, we will show you, What will happen when we pass wrong expressions, and NULL values to Try cast function in Sql Server. From the below screenshot you can see, it is returning NULL for the expressions. Because it is unable to convert them to the required data type. Let us use what will happen if we tried to convert the 65 (integer value) to XML data type. As you know it is not possible to convert an integer to XML implicitly, or explicitly. So, this function is returning Error as output. In this example, we will apply the SQL TRY_CAST function on our Employee table.